Gothic nurse so naughty she's on night duty, short sleeve mini dress with a zipper front, matching hat, stethoscope and play needle are included in this 4 piece costume. Shown with hosiery #1733 black. she'll get your heart racing 2 piece costume includes short sleeve mini dress with zipper and hat. She'll give you free exams in this 5 piece costume that includes dress, apron, head piece, gloves and stethoscope. Light up Costume. She's got the shot you need in this 5 piece costume that includes hat, dress, waist cincher and gloves. He'll find the spot where it hurts and make it fell better fast 2 piece costume includes long sleeve jacket and stethoscope. 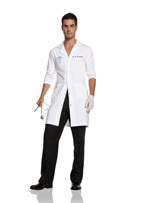 She'll take care of you on Dr's orders in this 4 piece costume that includes top, skirt, head piece and stethoscope. She'll make your heart race in this 5 piece costume that includes dress, belt, head piece, pin and stethoscope. Time for your sponge bath you lucky man 3 piece costume includes hair ties, purse and dress.